5 + eight = Required Please enter the correct value. (Kitco News) – World stock markets were mostly weaker Wednesday. U.S. stock indexes are also pointed toward lower openings when the New York day session begins. World stock markets are having a tough month of August, heading into the historically even tougher months of September and October. 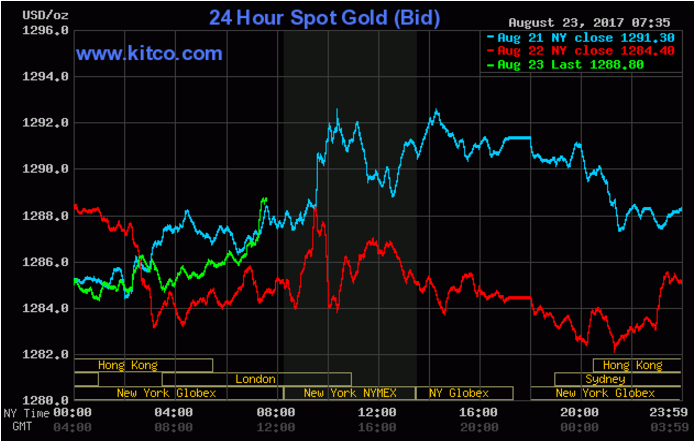 Gold prices are slightly higher in pre-U.S.-session trading. Gold prices are in a near-term uptrend, but struggle when prices approach the key resistance level of $1,300.00. In overnight news, the Euro zone Markit composite purchasing managers index came in at 55.8 in August from 55.7 in July. The August number beat market expectations. A reading above 50.0 suggests growth in the sector. The marketplace is awaiting the annual central bankers meeting held in Jackson Hole, Wyoming, Thursday through Saturday. Featured speakers from around the world include Federal Reserve Chair Janet Yellen and European Central Bank President Mario Draghi. Traders and investors will closely examine the Jackson Hole speeches for clues on future monetary policy moves by the world's major central banks. In recent years the Jackson Hole central bankers confab has significantly moved the markets. The key "outside markets" early Wednesday see the U.S. dollar index slightly lower. The greenback has been trading choppy and sideways at lower levels during the month of August. Meantime, Nymex crude oil futures are also slightly lower. Trading in oil has also been choppy recently. U.S. economic data due for release Wednesday includes the weekly MBA mortgage applications survey, the U.S. flash services PMI, the flash manufacturing PMI, new residential sales and the weekly DOE liquid energy stocks report. am i the only one to see a bear flag pattern formed on dec. gold daily bar chart……….